I was most intrigued to hear that Learn Digital Audio had created an online course explaining how to get the best out of Acustica Audio’s Nebula software. Nebula is a stunningly good software plug-in suite that can capture and replay detailed snapshots of loads of desirable audio hardware — but getting to grips with its idiosyncrasies can be a bit mind-boggling, for the novice and expert alike. Nebula Explained Professional uses the Udemy platform (www.udemy.com), which was designed specifically for instructors to build online courses. I was pleasantly surprised by its level of professionalism. If you’ve ever given a technical talk yourself, you’ll know how tricky it can be to make it entertaining as well as educational, but David Else has done a grand job here. He spent some eight months creating this course, which is well-explained, with clear delivery, and there are a few elements of humour thrown in. This is no long video essay with a handful of pics, but a carefully constructed set of 22 bite-sized lectures, each with a narrative lasting between three and 10 minutes and plenty of visual and audio examples en route. With the HD option enabled, the 720p quality setting provides very crisp video and audio quality, but for those who prefer pristine audio quality, some of the examples are also available as FLAC (lossless compressed) downloads. The lectures are split into five main sections — covering Introduction, Installation, The Graphic User Interface, Mixing With Nebula, and Conclusion — each of which ends with a handy quiz to ensure you’ve picked up all the points. In total, the course lasts some 2.5 hours, and there’s an awful lot to digest. 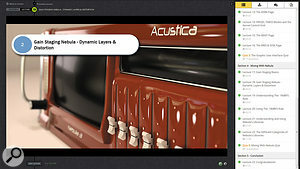 Admittedly some of the content (such as the Installation section) ought to be provided by Acustica Audio, but it’s not, so you’ll bypass an awful lot of potential confusion by following this course. It also covers plenty of high-level detail relating specifically to the vagaries of Nebula’s engine, such as RAM consumption, latency versus realism, transient response, correct gain staging to achieve the closest audio results to the original hardware, and customising and reorganising category names for easier access. Despite working with Nebula and its libraries for some years now, I gained a lot of new knowledge. For instance, I hadn’t twigged its ability to capture the dynamics of plate reverbs, including their twangy overload characteristics (not something that static convolution manages to do very well), while the course discussion of the differences between Nebula’s FREQD and TIMED modes and their combination into the SPLITH mode meant that this all finally made sense to me, as it explained a lot of the arcane tweaks that are said to improve the sound of certain Nebula libraries. I was also impressed that no punches are pulled: where Nebula shows deficiencies and limitations, these are explained in detail. Overall, working through this course is likely to save any Nebula user many, many hours of wading through the Acustica Audio forum FAQs, as well as hundreds of possibly useful, but sometimes confusing — and occasionally downright misleading — user posts. The Udemy hosting system even lets all course users post queries online that will be answered by David Else himself. If you subscribe to the course directly via www.learndigitalaudio.com it costs €56$95, which equates to €22$38 per hour of learning time, and once the fee has been paid you can revisit the course as many times as you like. I learned a huge amount from it that I’m sure will stand me in good stead in the future. (a simpler Nebula Explained Starter version is also available for $39) Martin Walker.